The Frook is a reusable, temporary bracing and spacer tool for use during the erection of roof trusses and is revolutionary in its design concept and application. We have now exhibited the FROOK in both Brisbane and Melbourne. At Designbuild in Melbourne the FROOK was one of the five finalists of fifty-one products entered in the New Product awards, most exciting for all. Roof Truss installation is one of the most dangerous tasks encountered during the construction of a building. Accidents which occur during the erection of roof trusses are often serious and can involve more than one person. The risk of injury during roof truss erection should be minimised and the Frook is a tool that will help you achieve this. The Frook is far superior in strength to other common methods used for temporary bracing of roof trusses. The Frook reduces the risk of injury by eliminating some of the more dangerous situations that arise during the erection of roof trusses. The unique design of the Frook and its ease of use allows for spacing corrections after roof trusses are in place. Many roof trusses fall as workmen remove bracing in order to make spacing corrections. The Frook helps to prevent such collapses. When you use the Frook you eliminate the Russian Roulette type risk associated with using two hands to juggle the roof truss, the spacer and the nail gun whilst attempting to space and brace the truss into its right position, whilst also holding on. Use of the Frook reduces the number of leads and hoses to trip over whilst hanging on to unrestrained roof trusses. Help minimise the risk of falling and serious injury. Help minimise the incidence of injury litigation. Help reduce insurance premiums. NOTHING COMPARES ON TODAYS MARKET. Frook’s patented technology allows roof truss installers to have the advantage of standing roof trusses on site faster than any other similar method currently being used. The Frooks unique design incorporates a clamp at one end and a hook at the other with a finger tip adjuster in between. The distance between roof trusses can be preset on the Frook before erection to minimise the need for adjustment after roof truss placement. The Frook is simple to use. Once the first roof truss is secured you attach the starter clamps to the top and bottom chords at intervals as per Australian Standards AS4440-2004 ie. maximum 3 metres on top chord and 4 metres on bottom chord. The Frooks for the next roof truss are then hooked through the eyelet of the first Frook and clamped onto the next roof truss when it is in position. 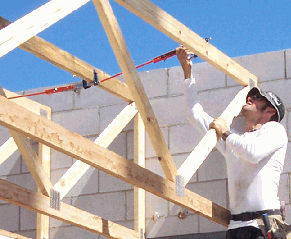 Conventional methods of temporary bracing often require the connection to be broken if a roof truss needs straightening. The Frook however allows for hand adjustment whilst the roof truss is in position by the use of the secondary adjustment mechanism. This allows for millimeter accuracy. You then simply repeat the procedure with the following roof trusses, attaching the Frook to the previously braced roof truss to create a continuous line of secured Frooks and roof trusses. Unlike other connectors or temporary braces the Frook can be used with varying timber width and roof truss distance. Additionally there are significant cost savings to be gained by using the Frook because of the substantial reduction of crane time on the job and the elimination of temporary bracing materials and associated preparation works. When the framework is in place and secure, you simply remove the Frooks and take them to the next job. The Frook comes in two standard sizes, 600mm and 900mm. The built in adjustment mechanisms and combination use will cater for any spacing from 330 mm to 950mm. Frook saves $$$$$$ - It's that simple. Click here to purchase your Frooks now.